Dedicated to increasing the understanding of the vital role of honey bees, and all pollinators, in our food systems and ecosystems. 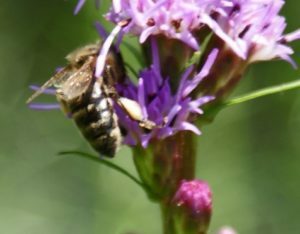 The Stratford Ecological Center Apiary is a working, educational apiary offering unique educational opportunities to beekeepers and non-beekeepers alike. Stratford is proud to offer variety of our educational opportunities in partnership with several organizations across Ohio. Honey Bee presentations are available to your school or group. If you are a teacher, part of a home school group, or a member of a gardening, or environmental, club and you are looking for an exciting presentation about bees and pollinators then the Stratford Apiary has many ways to help you fill that need! Stratford can customize the subject matter, presentations, and programs to fit with your science, biology, and other curriculum!